I'm not sure that canceling a home and home with Louisville was the best idea. Yes, this gives UGA a more nationally known, and much stronger, opponent than Louisville, but with UGA's last two season, is that really best for the Dawgs? Last year's opening loss to Oklahoma State set the table for an 8 - 5 season. I'm not saying the Dawgs can't handle Boise State, but the looming question is what if they can't? I've still got my fingers crossed that UGA has a few secret commitments that Coach Richt hasn't let anyone know about. Typically, UGA does have a trick or two up their sleeve, and this year (cough cough Isaiah Crowell cough cough) should be no different in bringing a true play maker to Athens (cough cough Isaiah Crowell cough cough). Maybe the Boise game in the Dome will help with recruiting. Ray Drew, Isaiah Crowell, Malcom Mitchell, Jay Rome, just to name a few, are still on the board and are very high on UGA's wish list. On top of a great recruiting class, next year's D should be somewhat improved with the addition of Jarvis Jones and Richard Samuel moving to his natural position as a linebacker. Also, year two under Todd Grantham and year two with Aaron Murray should be hugely helpful. Let's all pray Mr. AJ Green himself makes a reappearance in the Red and Black next year to go with Justin Houston staying an extra year to get a full grasp of the 3-4 before heading off to a long and prosperous NFL career himself. Personally, I'm excited for the Dawgs to get a big game on a big stage. Like Bill King said, "the Broncos haven’t yet beaten an SEC team and will lose some of the talent from their current team, but this isn’t the same Boise State program that D.J. and company throttled 48-13 in Athens back in 2005." But, I think McGarity made a great move. I think he is right for the program and can't wait for the future in Athens. 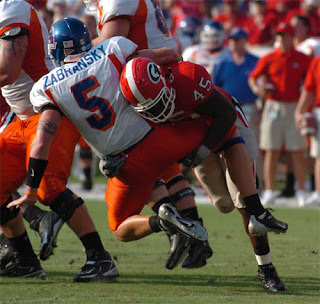 Check out Bill King's blog at http://blogs.ajc.com/junkyard-blawg/ and GOOOOOO DAWGS!!! My team cemented the best record in our conference, but just before halftime the pregame buffet caught up with me. Why do we wear white pants again? Oh Matty you glorious shitter. The Falcons now sit at 8-2 with a huge home game against the Packers this Sunday. The Packers and Falcons are the two best teams in the NFC and whoever wins is in the driver's seat for home field advantage. I know I am going to sound like a complete homer but I don't think I would take any other QB in the league right now over Ryan. The Packer's Aaron Rodgers is the better athlete and Tom Brady has more rings and Peyton Manning has more MVP's but if there is two minutes left in a game and the Falcons need a score to win it I would take Ryan over them. Rodgers and Manning would probably throw an INT and Brady isn't exactly the king of comebacks. And yes I know Michael Vick is having a special season up in Philly but nobody in their right mind would take him as their franchise quarterback over Ryan, Manning, Rodgers, and Brady. You know it's just a matter of time before he fucks up again. It's in his DNA so he can't help it.